So writes Pamela Z about her recent multimedia piece for live voice and video with electronics and recorded video, which she presented this past weekend at Royce Gallery in San Francisco. A brass carpenter’s plumb hangs in the center of the stage, which is not a stage but rather a space, defined by a screen on the right side, a projected rectangle of light that is variously filled with images or simply light on the back wall, a curtain to the left side, and a platform placed near the curtain, on which stands a small table and chair. Beginning with only the simplest of images, a cloudy smear of light on the screen and back wall, Pamela Z, seated with a laptop on the table, begins an incantatory sentence: “I saw you, and I know that you are …” Before the sentence is complete and its meaning clear, her voice, loops back interactively, begins to read over itself. Slowly through the layered vocal repetitions other phrases emerge: “Show me yes,” “show me no.” Over the murky projected images, text appears in yellow: “pendulum, (n.) a body so suspended from a fixed point …” The brass plumb/pendulum materializes, magnified, on the screens, where it swings back and forth rewriting and revising its image of itself. The pendulum defined, a prerecorded video moves us toward other connotations of the swinging object. Her face enlarged to fill the screen, Pamela Z asks, “Are you having trouble making a decision? Let’s toss a coin.” The coin, or rather the ghostly curve of a coin, spins slowly across the screen and into the soft grays that are the air surrounding it. The movement repeats. Its undeniable beauty entrances the viewers, we crave its repetition. “It’s tails. Is that OK?” Tossing a coin, it seems, is not a surrender to a seemingly arbitrary fate but rather a means of defining what you want, revealing to you that you have already made a decision. She moves to the side of the stage to a flight of stairs on which are traced the letters Y and N. The portable microphone/camera swings back and forth between the two. “You never say no but you don’t mean yes.” She wheels an overhead projector back to the stage area. On the projector she drops the yes/no questions written on acetate that members of the audience were asked to make before entering the gallery. As she reads out the questions, dropping them over the projector’s light, a prerecorded video of a fortune-telling eight-ball is projected on the back wall with her voice reading the answers. The questions fall onto the screen, the answers swim up to the glass window of the ball. Layers build; the random answers swing from the disappointing to the humorous. 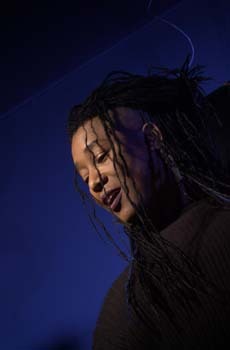 At one point, Pamela Z explains that her mother would often repeat a question she was asking because “the greater the number of iterations, the greater the resolution.” Unlike her mother, Pamela Z does not seek outside confirmation in her performance but rather the use of reiteration as a process of transformation: the accumulation of imagery and sound used as pathways to realize a spare and hypnotic beauty.